My 3 kids have watched me get up early, lace up my shoes, and hit the pavement on a fairly regular basis for several years now. They wish me luck as I head out the door and ask me how my run went when I return. Every now and then, they even ask if they can come along with me. 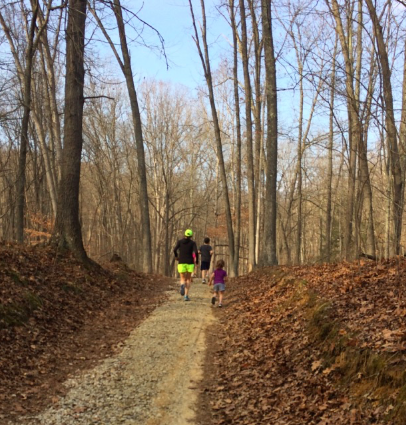 Only time will tell if any of my kids will eventually want to train for 13.1 or 26.2 miles with me one day, but, for now, here are some tips that I have found for encouraging my kids to get outside with me for shorter distances. DISCLAIMER: This list, is not comprehensive, and, as I note in all of my posts, I’m no expert. Running plans for kids are becoming more readily available (I have not used any of these plans with my kids, so I have no recommendation either for or against them), kids’ running programs continue to proliferate, and kids’ runs and fun miles are standing events at most road races. If you are looking for specific information regarding these offerings, a quick google search will yield multiple results. We can all come up with about 8 clichés re: the importance of actions over words, right? Even though the phrases are trite, most parents have discovered that kids constantly observe and often mimic our behavior. I can talk to my kids until I’m blue in the face about the joys of running, but seeing me consistently make time for running is much more persuasive than any carefully crafted and artfully delivered speech about the sport. My 9 year-old daughter and 11 year-old son were both generously gifted with their own Nintendo Switches (is that the correct plural??) by grandparents over this past year. Although we limit screen time, we have officially entered the world of kid gaming now and playing Zelda: Breath of the Wild or Smash Bros is now one of their preferred past times. SO, if one of them or their 6-year old sister asks to join me for a run now and then, you better believe I am going to accommodate that request. I’m not saying that running with me a couple of times is going to replace their interest in video games (or even that it needs to); but I am always motivated to encourage and facilitate hobbies that don’t include screens. Your kid expressed interest, asked to run with you, and is now by your side on the sidewalk/road/trail. How do you set the pace, distance, and goals for the run? Here’s the thing, if your kid is just starting to run with you, you probably don’t set pace/distance/goals. Now, this approach will vary based on your child’s fitness level, experience with running, and general interest. For me, however, when I run with my 11-year old son, I let him determine how fast we run and how far we go. Goal-wise, we discuss our intentions for the run before leaving the house, but we ADAPT as needed. When we run, I pay close attention to his pace, breathing, and ability to manage the route. If he’s spent by a half mile in, we turn around. Basically, we adjust based on how he well he is doing AND how far he wants to go. If I am trying to get a specific distance in that day, I will run with him as a warmup or cooldown and then get my miles in on my own. As a distance runner, I know that part of gaining fitness is the pain of getting in shape. But here’s the thing, ladies, when my kids go out for a run with me, they aren’t training for my half or full marathon (or 10k, 5k, etc). They aren’t paying attention to splits, elevation gain, or cadence. They’re out there to have fun! Yes, I encourage my older kids to run with me if they want to get in shape for soccer, baseball, or softball, BUT I am much more interested in fostering a running environment for them that is enjoyable than I am in building their mileage base. If your kids are struggling during a run, encourage them to keep moving if possible, but offer walking, a water break, or a shortened route as well. Tell them that running can be tough, but that they’re doing a great job. Tell them about how you have had similar experiences with running like that time when dad had to throw them into the van to come pick you up ASAP because half a mile into a 5-mile run you started having GI issues – yep, true story! There are lots of other tips that I could go into, but I’m just going to encourage you to keep leading by example. Our kids see our actions and recognize our habits (the good, the bad, and the ugly, of course!). Get them out to your races. Let them know that you are heading out for a run. Talk to them about your goals. One of the best ways to motivate your kids to run is to illustrate the joys of running for them. What tips do you have for getting your kids out on the road with you? I’d love to hear in the comments below! Jennifer is a wife, mom of three, runner, and PhD. She and her family recently moved back to the Carolinas after a five-year grad school stint in the Midwest. Jennifer is a cradle Catholic, and she began running almost thirty years ago, participating in her first road races as an elementary-school kid at the annual Knights of Columbus Turkey Day Run. She frequently turns to both the rosary and distance running (oftentimes simultaneously) for assistance in embracing the joys and the demands of family life and academic life. You can connect with Jennifer on Instagram.